The eloquently powerful The Silence of the Girls (2018) is Barker’s attempt to create just that, and she just about nails it. Barker’s novel is a re-telling of Homer’s The Iliad, told mostly from the point of view of Briseis, the young girl taken by Achilles as a spoil of war and then later taken from him by Agamemnon as compensation for having to give up his own “prize” when her priest-father calls down the anger of Apollo on the Greek soldiers. Barker begins in the harrowing moments before the Greeks sack Briseis’ city, and she is paraded out like a horse for Achille’s judgment (“Cheers, lads. She’ll do.”). The story then takes the reader through the big points of The Iliad: the spat with Agamemnon, Achilles sulking in his tent, Patroclus donning Achille’s armor and driving the Trojans back before being killed by Hector, Achilles’ grief and subsequent vengeance on not just Hector but Hector’s corpse, the pleading of Priam for his son’s body, Achilles’ acquiescence, and Achilles’ eventual death (not actually in The Iliad, I know) and its impact on Briseis. The focus in The Silence of the Girls is not on the war itself — there are no big battle scenes and only a few moments of actual description of the war. Most of it comes to the reader as it does to Briseis: “the sound of battle, clamorous at first, moved steadily further away until, by mid-afternoon, it was no more than a muffled clash on the horizon.” Instead Barker focuses on the quieter moments between individuals, especially the women who, as the above quote notes, are often the more grievous and most overlooked casualties of warfare. The terror of war for women begins, as noted, immediately. After the Greeks storm her city, Briseis watches as a woman is casually “raped repeatedly by a gang of men who were sharing a wine jug, passing it good-naturedly from hand to hand while waiting their turn.” Adding to the horror of the moment is that, as she’s raped, the woman is constantly reaching out and calling to her two sons, “twelve, thirteen years old perhaps [who] lay wounded and dying a few yards away from her.” When the footfalls of the Greeks could be heard approaching their tower chamber, Briseis’ cousin Arianna chooses to leap to her death rather than face the inevitable. thought all the stirring tales of courage and adventure were opening a door into my own future, though a few years later … the world began to close in around me and I realized the songs belonged to my brothers, not to me. Unfortunately, her life is upturned again when Agamemnon, forced by the Greeks to give up his slave-girl Chriseis, chooses to humiliate Achilles by taking Briseis from him. Achilles’ subsequent rage and refusal to fight has nothing to do with his feelings for Briseis and all to do with the insult to his pride, especially from a man whom he despises (Agamemnon is portrayed mostly as an incompetent, drunken lout of a general, mocked by the women as being a “back-door man”). It’s just a bit before this point that Barker has started to offer up a POV from Achilles’ perspective. Here we see him contemplating his own violence, as when at times he feels strangely detached from his own hands, permanently stained with blood. We also get his perspective on the choice he was granted — a long life of mundanity or a short life of glory, what he thought of his mother (the sea goddess Thetis), how Patroclus became his dearest intimate, and finally, we see into the all-encompassing grief and fury that overtake him at Patroclus’ death. The Silence of the Girls gains weight and gravity as it continues. At one point toward the latter third Briseis offers up the typical Homeric catalog of deaths, those Achilles killed in battle as he attempts to avenge Patroclus. But partway through she stops and asks, “But you see the problem, don’t you? How on earth can you feel any pity or concern confronted by this list of intolerably nameless names?” And so, she slows the narrative to show snippets of the victims’ lives, bits of humanizing detail garnered from their mothers and sisters. How Mulius, “the one with Achilles’ spear point sticking out of his ear,” as a baby “never crawled, never shuffled around on his bum or anything like that, just straight stood up.” Or how Iphition, the first time his father took him fishing, could never get the worm to stay on the hook, “But give him his due, he went on trying. He was like that — he wouldn’t give in.” The section is poignantly heart-breaking even as it offers up sharp criticism of the usual portrayal of war. This is Briseis’ story, after all, and so it is right she get the last word in that scene, but extricating herself from the world and narratives of men is not easy, and Briseis gives voice to that in meta-commentary throughout: “Looking back, it seemed to me I’d been trying to escape not just from the camp, but from Achilles’ story; and I’d failed.” Whether that opinion still holds at the end I’ll leave to the reader. My only criticism of The Silence of the Girls is that, at times, Barker drops into a surprisingly jarring modern vernacular, having soldiers refer to breasts as “knockers,” for instance, or referring to “the weekend,” (which I’m pretty sure didn’t exist back then). One doesn’t therefore feel quite as steeped in antiquity as one does in Madeline Miller’s fantastic Circe (also highly recommended, and a book that would make a great companion novel to this one). But those moments are relatively few and easily passed over in a book that sheds such a new light on an old story. 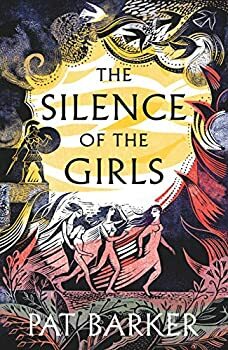 Achilles might be the hero of The Iliad, and his voice even in this novel is, as Briseis says, “always so dominant,” but like Briseis, for the reader, “it will be the girls I remember most.” Highly recommended. The very first line of The Iliad implores the goddess to sing of the wrath of Achilles. Achilles is (if we’re getting technical here) the fifth word out of the entire epic poem in the original Greek. It is rather fitting then that Pat Barker’s epic retelling opens with the lines, ‘Great Achilles. Brilliant Achilles, shining Achilles, godlike Achilles…’ But this is going to be a very different kind of tale. Because The Iliad is traditionally a poem about men, by men, for men. 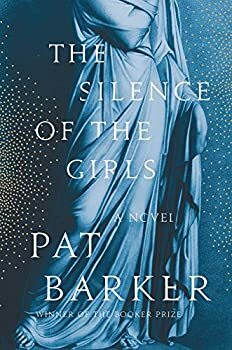 Yet in The Silence of the Girls, Barker offers us the viewpoint of voices that have never before been heard. The story is told through the eyes of Briseis, the nineteen year old queen of Lyrnessus. We meet her hiding inside the walls of a neighbouring town of Troy, sheltering amongst other noble women and children whilst the battle cry of Achilles grows ever closer. The Greeks, inevitably, breach the city and Briseis sees her brothers and father brutally killed before she is taken as a spoil of war. Shortly thereafter, she is claimed by Achilles himself. What follows is the account of her time in the Greek camp amongst the other unheard voices of the war: the women. She lives in a world where rank means nothing: the only things valued are youth and beauty, and former slave girls are held in much higher esteem than their old mistresses. The plight of these women is a difficult one, and Barker does not sugar-coat their experiences. There are no epic battle scenes, but Briseis’ account of the war is brutal, from her brother’s gory deaths to her nightly rapes by Achilles; it is horror experienced on a much more personal level, and sometimes makes for quite harrowing reading. Barker won the Man Booker Prize back in 1995 and there has been widespread surprise that The Silence of the Girls did not even make this year’s longlist. Barker’s prose is sparse, unadorned and incredibly readable; there is no doubt that she is a master of her art. Whilst there are times that the plot seems to meander without purpose, Briseis’ tale is a compelling one, and readers will follow it avidly as Achilles and Agamemnon dispute over their ownership of her. Some readers may find the occasional colloquialisms a little jarring. Soldiers use language more commonly found in a modern-day pub. Needless to say, it doesn’t quite fit the epic setting. But perhaps more fitting to our modern sentiment is the fact that this is a story that needs to be told. Women across the world are currently finding their voices and it is apt that this great story of men should finally be told from a woman’s viewpoint. Published in September 2018. From the Booker Prize-winning author of the Regeneration trilogy comes a monumental new masterpiece, set in the midst of literature’s most famous war. Pat Barker turns her attention to the timeless legend of The Iliad, as experienced by the captured women living in the Greek camp in the final weeks of the Trojan War. The ancient city of Troy has withstood a decade under siege of the powerful Greek army, who continue to wage bloody war over a stolen woman–Helen. In the Greek camp, another woman watches and waits for the war’s outcome: Briseis. She was queen of one of Troy’s neighboring kingdoms, until Achilles, Greece’s greatest warrior, sacked her city and murdered her husband and brothers. Briseis becomes Achilles’s concubine, a prize of battle, and must adjust quickly in order to survive a radically different life, as one of the many conquered women who serve the Greek army. When Agamemnon, the brutal political leader of the Greek forces, demands Briseis for himself, she finds herself caught between the two most powerful of the Greeks. Achilles refuses to fight in protest, and the Greeks begin to lose ground to their Trojan opponents. Keenly observant and cooly unflinching about the daily horrors of war, Briseis finds herself in an unprecedented position to observe the two men driving the Greek forces in what will become their final confrontation, deciding the fate, not only of Briseis’s people, but also of the ancient world at large. Briseis is just one among thousands of women living behind the scenes in this war–the slaves and prostitutes, the nurses, the women who lay out the dead–all of them erased by history. With breathtaking historical detail and luminous prose, Pat Barker brings the teeming world of the Greek camp to vivid life. She offers nuanced, complex portraits of characters and stories familiar from mythology, which, seen from Briseis’s perspective, are rife with newfound revelations. Barker’s latest builds on her decades-long study of war and its impact on individual lives–and it is nothing short of magnificent. There are some really excellent retellings of Greek tragedies being published this year — I wonder if there’s a reason behind the trend, or if people are just looking for fresh takes on old stories? I think it’s a “tired of the same old male take on everything including the classics we all keep going back to and minding.” It kind of recreates the canon not by replacing the old white guy stories but by viewing them through a different keyhole. I’m really enjoying this surge in looking at familiar stories from different/neglected viewpoints. I can’t remember, Bill — have you read Margaret Atwood’s Penelopiad? It’s the most recent of her works (granted, from 2005) that’s really stuck with me. I did and agree it’s one of her better later-run books. I’m also thoroughly enjoying this new slant genre (as opposed to retelling or reusing like Novak does so well for instance). Perhaps we’ll start seeing some of the dramas redone . . .